The festive season is well and truly underway in Loughborough after thousands of people packed the town centre to see the Christmas lights being switched on. Crowds gathered for the annual event which saw a host of entertainment throughout the day before the town was lit up. 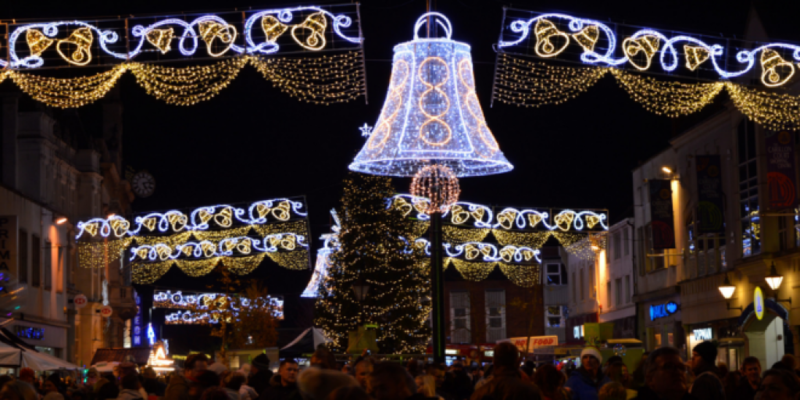 The lights, newly installed this year by the borough council, were switched on by Alex and Megan Hutton, the winners of a competition run by the council and the Loughborough Echo. The youngsters were chosen because of their commitment to supporting their family, including grandad Keith Pervin who has had some recent health issues. It was made extra special as it was also Alex’s ninth birthday. Alex and Megan,10, were joined on stage by the cast of this year’s pantomime, Beauty and the Beast. Cllr Jenny Bokor, lead member for Loughborough said: “It was great to see so many people in town and the new light displays look fantastic. “It was also lovely to watch our competition winners Alex and Megan switch on the new lights this year. “The day was filled with festive fun with entertainment from local musicians and Capital FM. Visitors enjoyed a variety of food and charity stalls and Santa’s grotto in the morning. The Sock Gallery also hosted an arts and crafts fair in the Loughborough Town Hall. Entertainment for the day started with performances from local artist and groups. Capital FM entertained the crowd with live competitions and music videos on a giant screen. There was a host of musical entertainment including performances by Loughborough Students' Union Sing, St Botolph's School Choir, Bright Lights Theatre School and Loughborough Schools Foundation Sax Ensemble.